After making the Small Cast Iron Skillet Chocolate Cake, I am now enamored with small skillet cakes. 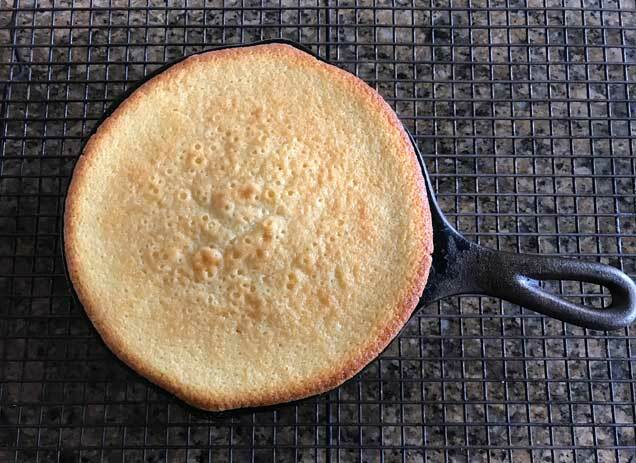 I can’t say the skillet does anything special for the cakes like it does for cornbread or brownies, but a 6 1/2 inch skillet makes the perfect size cake for our family and the skillet just looks so cute. So here’s the second version, Cast Iron Skillet Caramel Cake. The cake is one of my old cupcake recipes that uses the two-stage method. You mix all the dry ingredients, coat them with fat, then add the egg and liquid. The caramel frosting is my new favorite. It’s rich and creamy and made in a microwave. 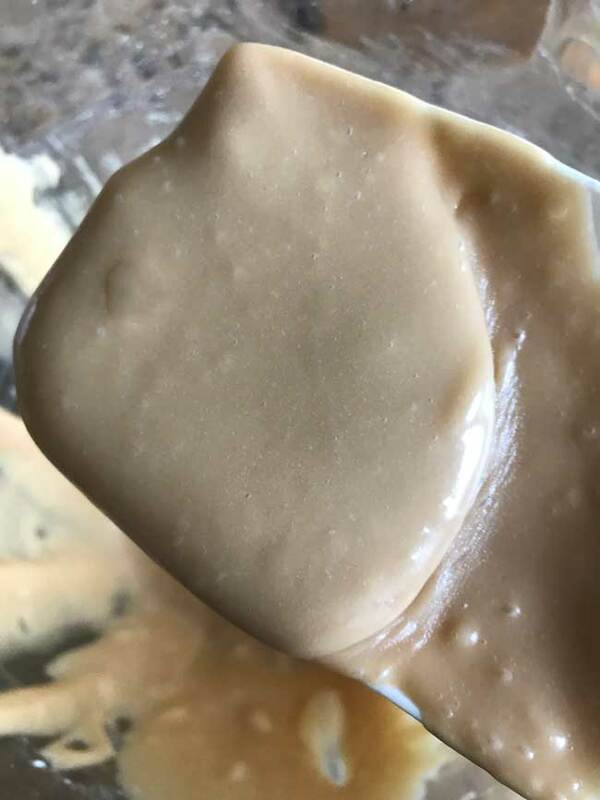 It’s basically a combination of my favorite easy caramel frosting recipes (Anne Byrn’s, for the most part), but I scaled it down and used the microwave rather than the stove. It’s a creamy textured caramel icing that still crusts over but stays kind of creamy underneath the crust thanks to the butter. I’ve made the cake twice with success both times. My biggest tip is don’t be tempted to throw all the batter into the skillet! Make sure there’s 1/2 inch of room left for the batter to climb. The second time I made the cake I stuck a cupcake liner in a small custard cup and baked a little sampler cake. 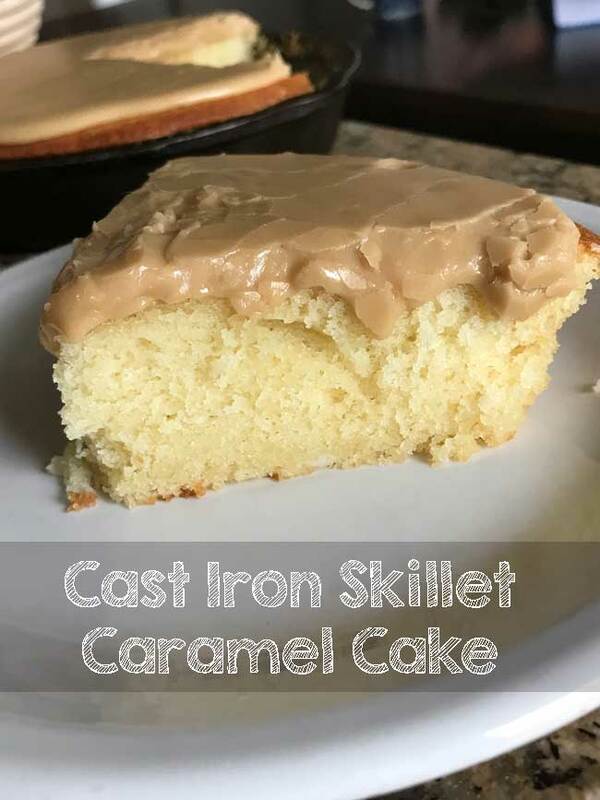 Small caramel cake baked in a cast iron skillet and topped with an easy microwave caramel frosting. Cut the butter into small (about 8) pieces and put it in the skillet. Set the skillet over low heat, just enough to heat the skillet, then remove from heat and let the butter soften in the hot skillet. Do not let it melt. While butter sits, prepare the dry ingredients. In a mixing bowl, mix the flour, baking powder, salt and sugar for about 60 seconds or until uniformly mixed. 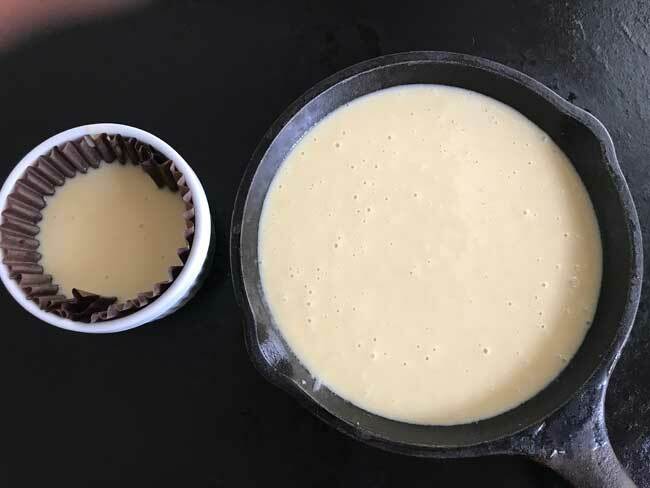 Add the softened butter to the dry mixture (leaving behind a thin layer of butter on the skillet) and stir with a heavy scraper so that softened butter coats flour. Add the oil and continue stirring until mixture is the texture of dirt. In a small bowl or liquid measuring cup, beat the egg lightly with a fork. Add 2 tablespoons of the milk to the egg. Gradually add the egg mixture a few spoonfuls at a time to the flour mixture, stirring with the scraper until blended. Add the remaining milk and the vanilla and beat with the scraper until smooth and shiny. Scrape batter into the pan leaving at least a half inch for it to climb. You may have a little batter left over. Don’t be tempted to just pour it all in or your cake might overflow. Set the cast iron pan on a rimmed baking sheet and bake for 30-35 minutes. 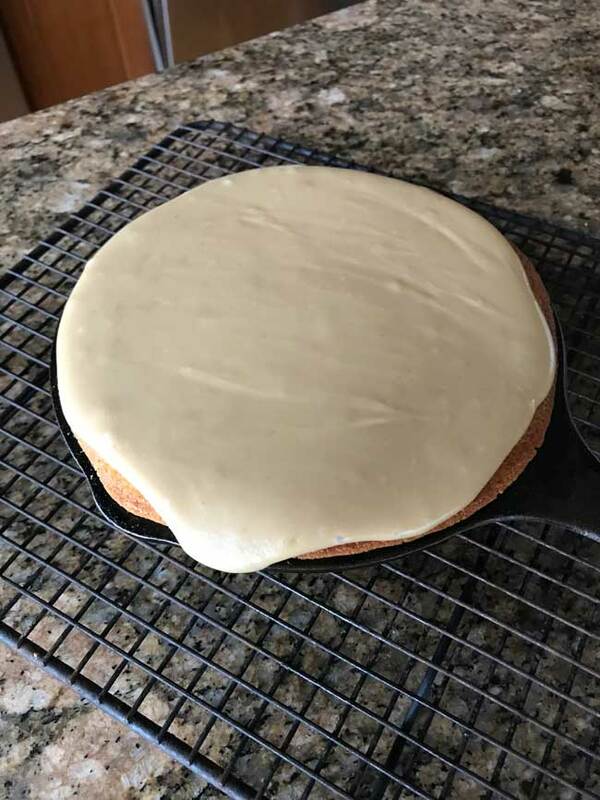 Allow the cake to cool while you make the caramel frosting. Gently melt the first 2 tablespoons of butter in a deep microwave-safe bowl. Add the brown sugar and evaporated milk. Microwave on high for 30 seconds. Remove from microwave and stir until smooth. Return to microwave and cook on high for another 30 seconds. Stir well. Allow mixture to cool for about 15 minutes, then add powdered sugar and beat with a hand held mixer on low until smooth. Add softened butter and vanilla and beat with a handheld electric mixer until creamy. Add salt to taste. Icing should still be a little soft at this point. Spoon if over the cooled cake so that it flows to the edges and allow it to set. If you want the frosting to be thicker and spreadable, let the brown sugar mixture cool longer. For this cake, I like the frosting to be a little runnier so that it can be spooned over the top. If using powdered buttermilk you can use a little less than 2 tablespoons (about 5 teaspoons) of powdered buttermilk mixed in with the flour mixture, then sub water for the milk. I will look forward to making this someday! Cheryl, do you have a 6 inch cake pan? That size should work. Looks really good and I like the small size. But alas, no cast iron pan . So what size cake pan do you think would work? The texture of the cake looks amazing! Now I need a small cast iron skillet!! LOVE that tip to pop a cupcake liner in a ramekin.